IKEA has previewed a collection of space-saving furniture and homeware inspired by life in space, to cater to customers living in micro homes. The Rumtid collection will consist of four different product ranges that explore different issues: time, space, water and air. These are based on research carried out by IKEA at the the NASA Mars Desert Research Station in Utah last year, to "explore the future needs of urban, small space living". The brand unveiled the first three designs during Democratic Design Days, its annual two-day conference, yesterday, 7 June 2018. They include a redesign of the air purifier, a new super-lightweight material and a small indoor garden. The new lightweight veneer material is made out of "wood and waste", rolled into strong hollow tubes. 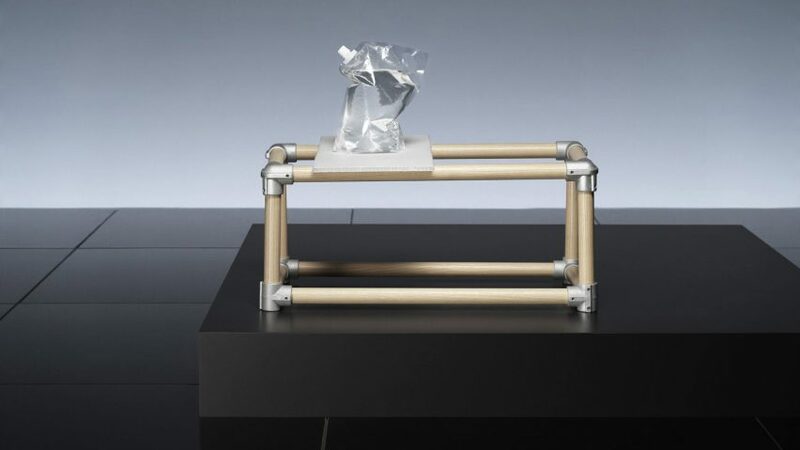 The tubes can be joined together with connectors to form custom furniture solutions. Due to the system's flexibility and its sustainable production process, IKEA said the veneer components are ideal for creating furniture for small space living. Speaking at Democratic Design Days, IKEA's head of design, Marcus Engman, described the components as a scaffolding system. "You can be creative with it and build your own stuff," he said. "By cutting the tubes into different lengths and clamping them together we can build just about anything, be it sofas, wardrobes, beds, or something else completely," added creative Michael Nikolic, who led a group of seven designers for the project. "This is a high-tech, efficient way of using our natural resources." Few details have been released of the air purifiers, but images show boxy designs featuring geometric-cutout patterns. They will come in three different sizes and three colours: green, red and off-white. The same goes for the Rumtid Garden, which looks like some kind of terrarium. IKEA revealed that collection will also include a "functional textile [that] cleans the air". IKEA first announced plans for the space-travel-inspired range in 2017. Developed in collaboration with NASA and Lund University School of Industrial Design, it aims to learn from the experiences of scientists and engineers developing vehicles for space travel. "We want to learn from extreme scenarios and connect them back to Earth, focusing on urbanisation and small space living," said IKEA's Siri Skillgate, who worked on the project with Elea Nouraud, Jon Karlsson, Philipp Süssmann, Jingbei Zheng, Robert Janson and Pauline Matika. The team also spent time in Tokyo staying in capsule hotels, to experience urban small-space living first hand. "In Tokyo, there’s a literal built-in thinking around small space living that allows for modularity and mobility," said Skillgate. We felt really inspired by all of the interesting solutions in people's homes and at the capsule hotels – particularly when it comes to storage." "What we wanted to do was to go into the extremes. Space is an extreme way of living, and the capsule living in Tokyo is also extreme, so we wanted to learn from that and do better solutions." Several new designs were announced during IKEA's Democratic Design Days yesterday, 7 June 2018, in Älmhult, Sweden. The brand also revealed a portable party collection by Teenage Engineering, maximalist designs by Swedish artist Per B Sundberg and new products by fashion designer Virgil Abloh. The space-inspired products are just one of a number of upcoming collections to be previewed during IKEA's Democratic Design Days yesterday in Älmhult, Sweden. The brand also revealed a giant receipt rug by Virgil Abloh, a portable party collection by Teenage Engineering, and maximalist designs by Swedish artist Per B Sundberg. Rumtid will launch in stores in 2020.